There'll probably be an additional random piece or two in there based on things I've been tinkering with as well, such as a new Reading List, but those are the three primary topics for this month. I've also compiled a much larger list of nations to produce SAM Network pieces on, and have started a pretty good list of potential Week 3 topics for the coming months. At the very lest, it looks like I've successfully managed to develop and stick with a schedule! Many individuals may be suprised to know the identity of the largest and most capable SAM network in Europe outside of Russia. The distinction goes to the Ukraine, the inheritor of numerous legacy Soviet SAM systems and facilities after the fall of the USSR. More importantly, many of these systems were top of the line during the 1980s, providing a very solid technology base on which the Ukraine would be able to rely going towards and into the 21st century. The Ukrainian Air Defense Force is responsible for operating the radar and SAM systems tasked with defending Ukrainian airspace. The force is subordinate to the Ukrainian Air Force, and operates S-200 (SA-5 GAMMON), S-300PT (SA-10A GRUMBLE), S-300PS (SA-10B GRUMBLE), S-300V1 (SA-12A GLADIATOR), and Buk (SA-11 GADFLY) SAM systems. The Ukrainian Army operates separate, subordinate SAM assets for providing battlefield air defense. Engagement zones will match the color of the icon for their respective system. 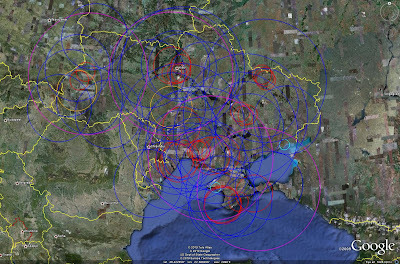 Early warning over the Ukraine is provided by various radar sites located throughout the nation. These sites typically host one or more types of EW radar, as well as height finding and IFF interrogation systems. There are forty-one active EW sites, with thirteen additional inactive sites available for network expansion or asset redeployment should the need arise. Note that this does not include organic EW radars deployed at SAM sites, which provide further coverage overlap. Primary EW assets are a mixture of legacy FSU systems. These assets are commonly deployed at mixed-type EW sites, ostensibly to capitalize on the different capabilities of different radar systems. The most commonly identified system is the P-35/37 (BAR LOCK), with P-12/18 (SPOON REST), P-14 (TALL KING), P-19 (THIN SKIN), and P-80 (BACK NET) also scattered throughout the nation. The 1L13 BOX SPRING is deployed to support S-300V1 batteries to provide additional EW capability. Thirty 36D6 (TIN SHIELD) and seven 64N6 (BIG BIRD) sites provide target identification and battle management functions for the Ukrainian SAM network. 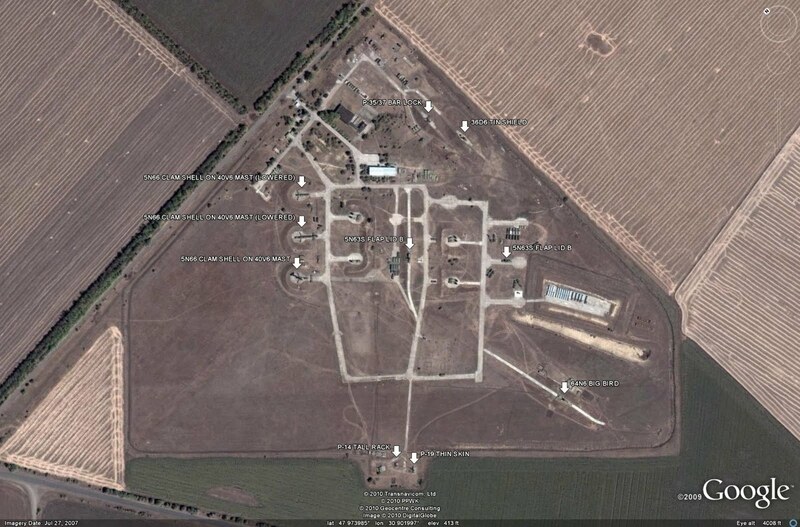 One 36D6 sites is co-located with an S-300PS unit, possibly providing direct support to the assigned batteries. The 36D6 and 64N6 radars are positioned to provide overlapping coverage. 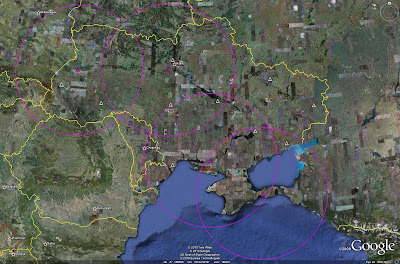 These systems are capable of monitoring virtually all of the Ukraine's airspace, as well as significant portions of the Black Sea and the Sea of Azov, and as such the 36D6 radars may have a basic EW or GCI function as well. 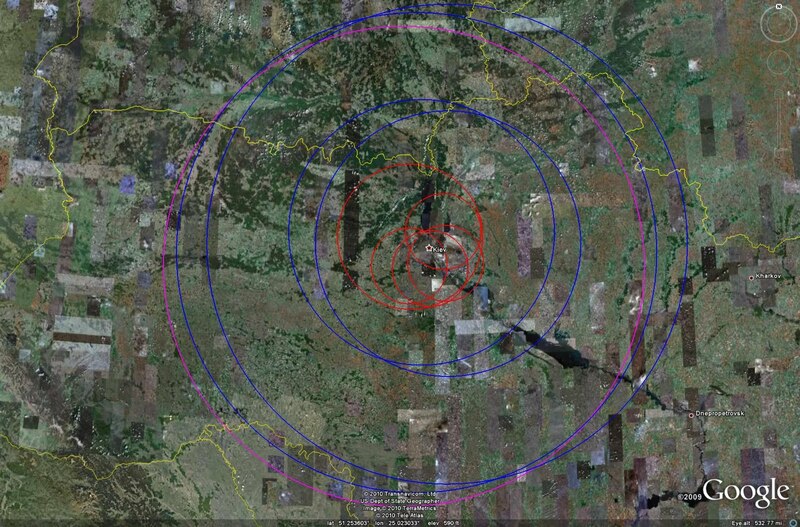 The coverage zones of the identified 64N6 battle management radar sites can be seen in the image below. A further 64N6 is likely positioned near L'viv, as there is an S-300PT battery deployed at a prepared site in the area. 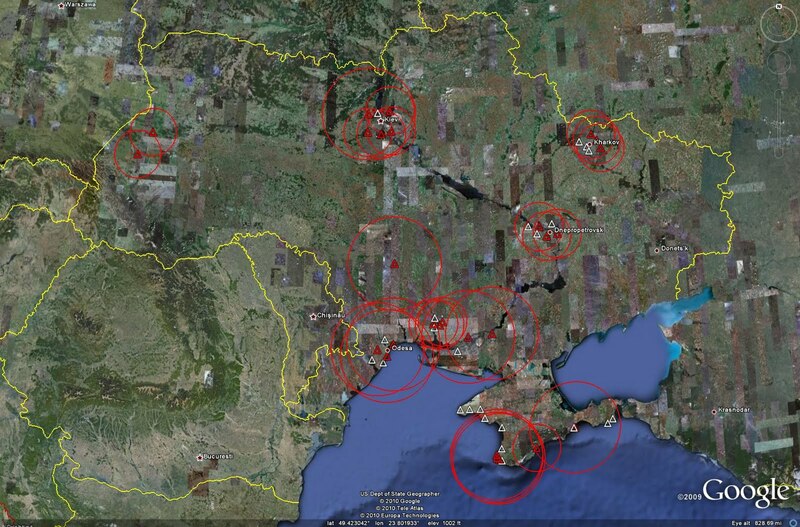 Likewise, 64N6 sites near Odessa and Sevastopol are not likely to remain inactive for an extended period as numerous S-300PS batteries are deployed in each area as well. The S-200 is the longest-range SAM asset available to the Ukrainian Air Defense Force. Four active S-200 batteries provide air defense over all but the far eastern region of the nation between Kharkov and Lugansk. A further twelve inactive S-200 sites remain, although these are likely to be reused as homes for mobile assets such as the S-300PS if at all, due to the time required to redeploy an S-200 battery. The Ukrainian Ministry of Defense (MoD) claims that the 250 kilometer range S-200V is in service, but the October 2001 shootdown of a Russian airliner over the Black Sea by an errant S-200 would seem to indicate that the 300 kilometer range S-200D is the variant operated by the Ukraine. The Russian airliner was reportedly no closer than 250 kilometers to the launch site and flying towards the Russian coastline. Hitting a crossing target at 250 kilometers would be nearly impossible with an S-200V, but would be within the capability of the S-200D. The S-200 is the longest-ranged Ukrainian-operated SAM system, but the S-300P variants represent the most capable and widely deployed systems. Twenty-seven S-300P series SAM batteries are in active service; sixteen batteries are equipped with the S-300PT, while eleven are equipped with the more capable S-300PS. 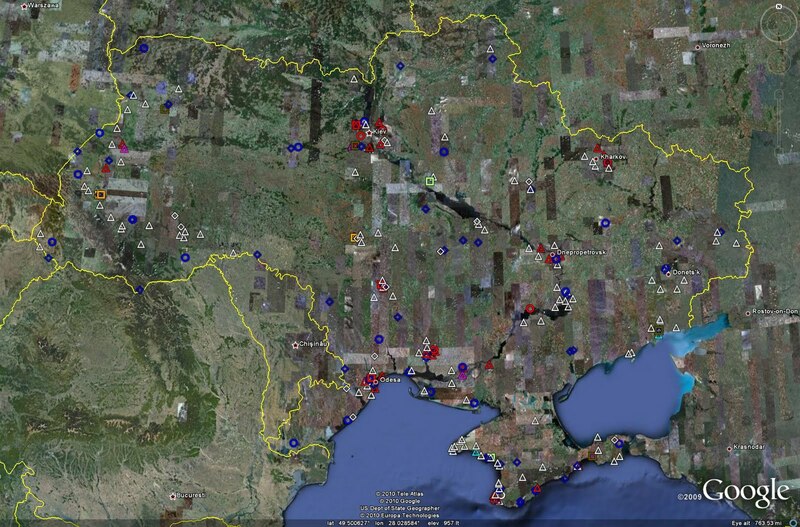 Examining these sites in conjunction with the twenty-three inactive S-300P sites provides a great deal of insight into the deployment strategy of air defense assets within the Ukraine. The S-300PT and S-300PS batteries are deployed to protect the most critical political, urban, military, and industrial areas in the nation. Dnepropetrovsk, Kiev, Kharkov, Odessa were each defended by no fewer than six batteries at one point, while Nikolayev and Sevastopol were defended by no less than five apiece. 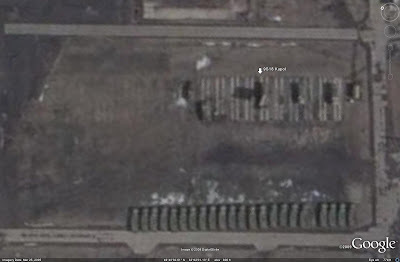 Standard deployment practice deduced through imagery analysis indicates that a full-strength S-300PT battery has twelve TELs, while a full-strength S-300PS battery has eight TELs. Each battery is equipped with a 5N63 or 5N63S (FLAP LID) engagement radar, as well as a 5N66 or 5N66M (CLAM SHELL) low-altitude detection radar. 40V6 series mast assemblies are commonly employed for both radar systems. 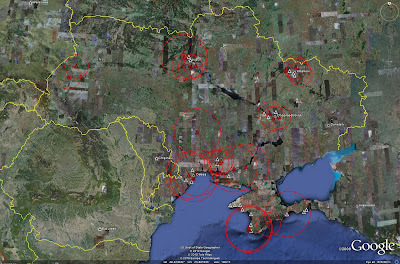 The capital of Kiev is the most heavily defended location, with five S-300P series batteries. Of the five active sites, four operate the S-300PT and one operates the S-300PS. 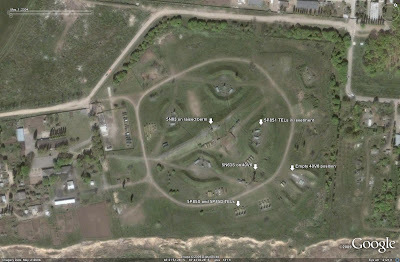 The sixth site was occupied by an S-300PS battery, but as of April 2009 the site was unoccupied. This could be due to scheduled maintenance, deployment to a training facility, or site relocation, suggesting that a full complement of six batteries may still be assigned to defend the capital. Dnepropetrovsk (S-300PT), Kharkov (S-300PT), Nikolayev (S-300PT), Odessa (S-300PS), and Sevastopol (S-300PS) are currently defended by three active batteries apiece. 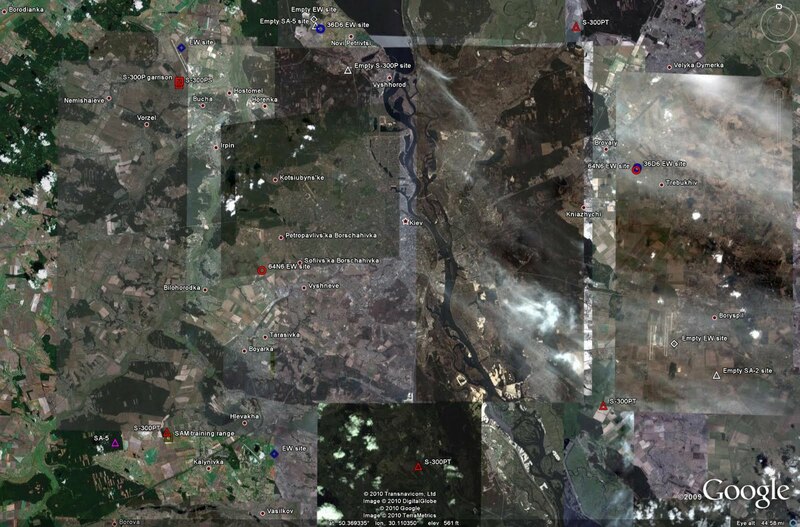 The following image depicts the coverage of the air defense assets deployed around Kiev. Note the significant degree of overlap present in the S-300PT and S-300PS batteries. 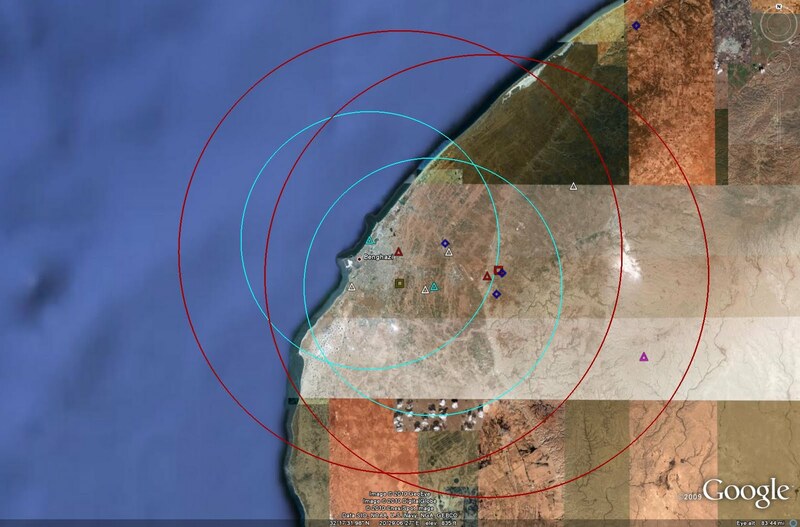 36D6 EW radars can be co-located with S-300PT and S-300PS batteries to take advantage of added target acquisition support should the need arise. An S-300PS battery near Pervomaysk, seen in the image below, currently possess an on-site 36D6 EW radar, indicating that this type of interoperability may be practiced within the Ukraine even if it is not widely utilized in peacetime. However, due to the presence of other EW assets, it is also possible that a dedicated EW unit is simply co-located at the site, which would indicate that interoperability between the 36D6 and S-300P series is not necessarily utilized. Recent activity near Odessa suggests that the older S-300PT may be being phased out, or at the very least redeployed to less important regions. 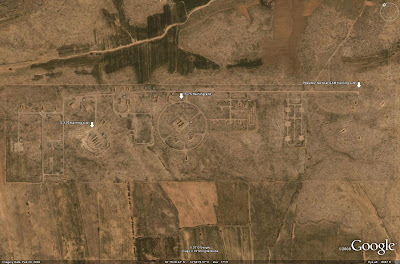 A site south of Odessa was imaged in 2004, and was seen to be home to both an S-300PT and an S-300PS battery. 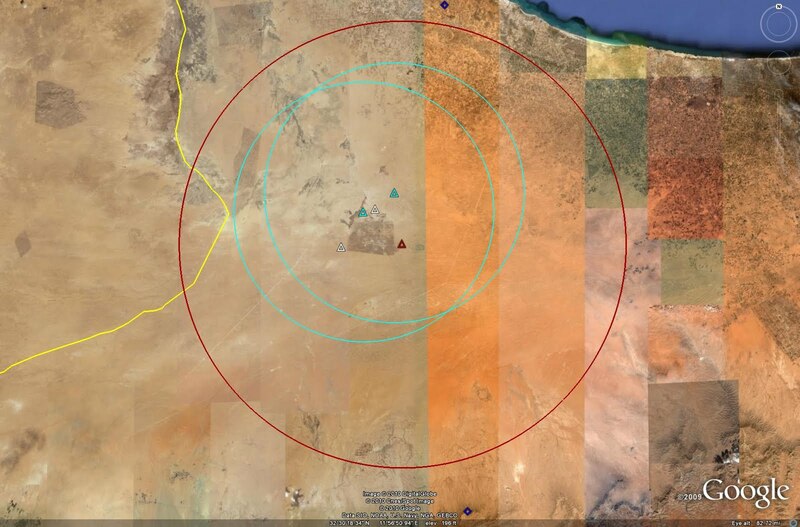 As can be seen in the image below, the S-300PT battery occupied the site proper, with the S-300PS battery being deployed along the southeastern periphery. 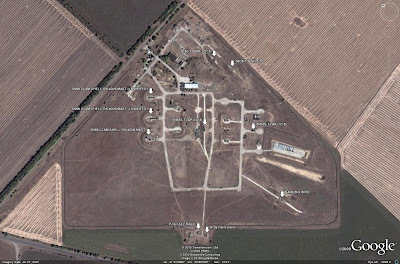 In 2007, the same site was reimaged, with the S-300PS battery seen to have taken over occupation of the site proper, with the S-300PT battery having been removed. Evidence of this sort of realignment or redeployment can be seen at other locations in the Ukraine as well. S-300PT batteries are deployed predominantly at older-style S-300P sites, containing six revetments for two TELs apiece, or four revetments for three TELs apiece and a position for a mast-mounted 5N63 in the center. 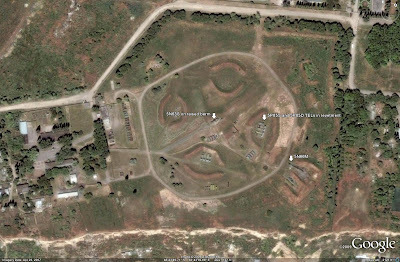 S-300PS batteries are deployed predominantly at newer-style sites, featuring four TEL revetments and a significant raised berm in the center for the mobile 5N63S engagement radar. 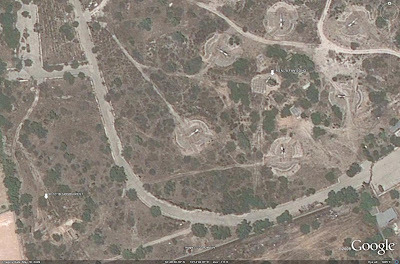 It is likely that the S-300PT sites were built over old S-75 locations, perhaps explaining the similar launcher revetment placement. At any rate, an S-300PS battery northwest of Kiev is deployed at what would typically be a six-revetment S-300PT site. 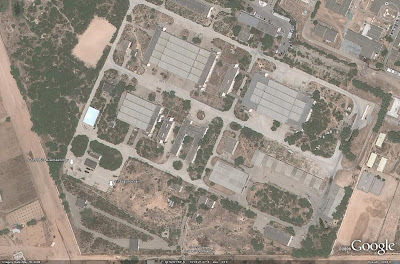 This likely indicates that the S-300PS replaced an S-300PT battery at this location at some point prior to 2003, when the earliest available imagery was captured. Furthermore, the native language website for the MoD no longer claims that the S-300PT is operated, only listing the S-300PS. It is therefore possible that the S-300PT is in fact being phased out. The latter case is interesting given that there are still numerous S-300PT batteries operational in imagery captured as late as September of 2009. This could indicate that the S-300PT is perhaps no longer serviced, and will be allowed to retire on a battery-by-battery basis as service lives are exhausted. One strategic-level SAM asset which may still be operated by the Ukrainian Air Defense Force is the S-125. The S-125 was imaged at two active locations in 2002 and 2003, but has not been mentioned in the Ukrainian MoD's annual White Book as far back as 2005. The latter fact indicates that the system is not currently being trained on or funded for service life extensions, occurrences which would be necessary for the system to remain viable into the future. Given that these events have not taken place, it is likely that the Ukrainian S-125 batteries were removed from service between 2003 and 2005. While further analysis is necessary to make a definitive statement to that extent, the evidence does suggest it to be the case. 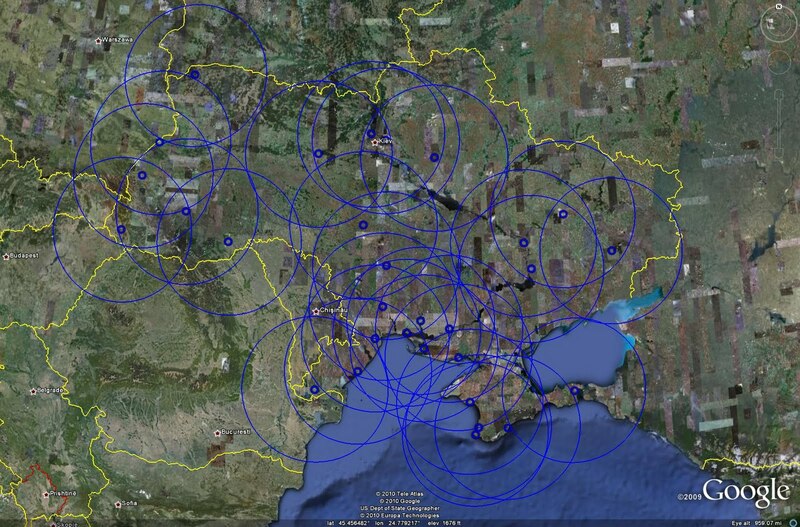 There are two tactical SAM systems which serve in the Ukrainian air defense network. The Ukraine operates both 9K37 Buk and S-300V1 systems, with a portion of these systems being subordinate to the Air Defense Force. The Ukrainian MoD claims that the Army operates the Buk-M variant, with the Air Defense Force operating the Buk-M1. The MoD also claims that the Army and Air Defense Force operates the S-300V1 (SA-12A GLADIATOR), indicating that the Ukraine may not be in possession of the S-300V2 (SA-12B GIANT) ATBM system. Two Buk garrisons and three S-300V1 garrisons have been identified, with S-300V1 components seen field deployed near two garrisons. The garrison affiliations cannot be effectively determined, as the Ukrainian Army and Air Defense Force each operate both systems, although the Zolotonosha garrison displaying the Kupol radar may be affiliated with the Ukrainian Army if the original Kupol radar was in fact retained in the Ukraine's "Buk-M" system. 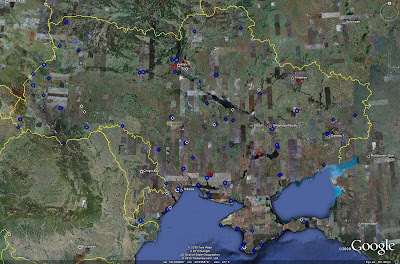 The Ukrainian SAM network was inherited from the USSR following the collapse of the latter nation. Air defense assets are organized to defend key population centers and geographic regions. 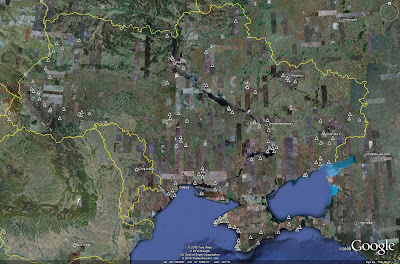 The capital of Kiev, key industrial and urban centers Dnepropetrovsk, Kharkov, Nikolayev, and Odessa, and the Crimean peninsula are home to the majority of the assets. 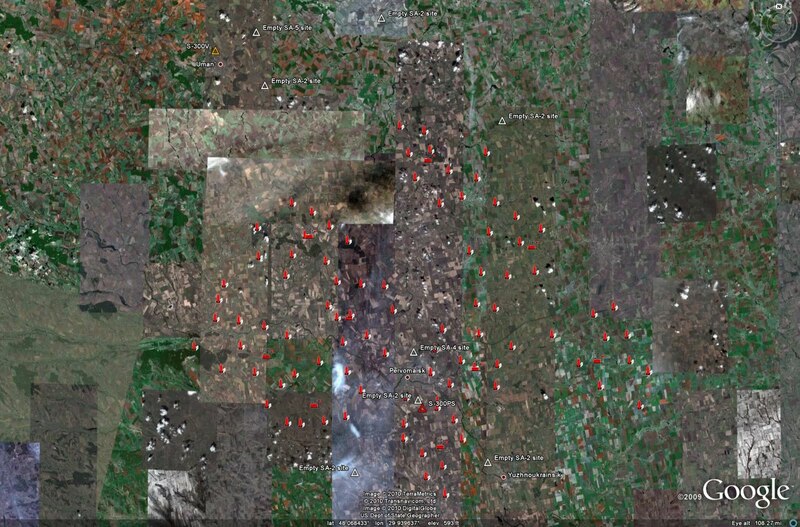 Other assets are scattered throughout the nation and along the western border. 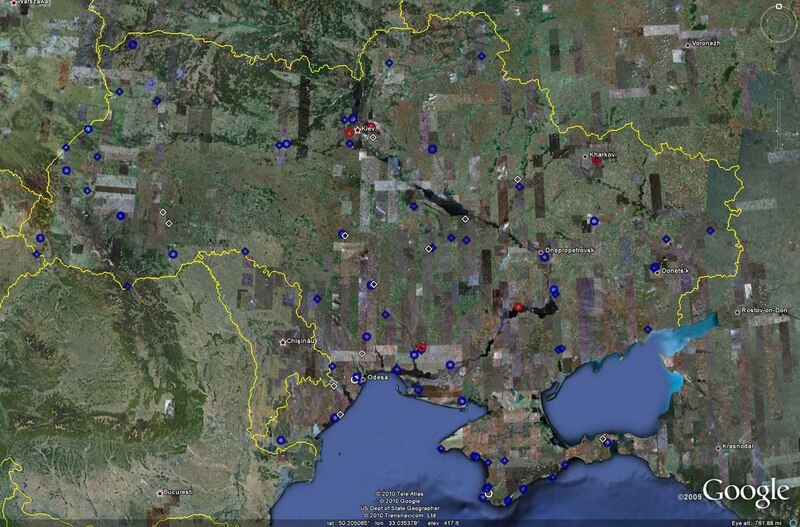 As can be seen in the images above, the Ukraine enjoys near-total nationwide EW coverage and boasts a layered SAM defense network around multiple key locations. While the network no longer faces the threat of a war against NATO, and has downsized significantly since the fall of the USSR as a result, the Ukraine remains very well equipped to defend itself from aerial attack. The possible recent retirement of the S-300PT by the Air Defense Force will not necessarily impart a significant loss of capability in terms of overall coverage to the network. While the S-200 is not well suited for engaging maneuverable, non-cooperative, or low-RCS targets, it can deter any ISR platforms or other large combat aircraft from approaching Ukrainian airspace. Given that the S-300PS has a maximum engagement range of nearly double that of the S-300PT, 90 kilometers to 47, it would be possible to redeploy S-300PS batteries around key locations in a fashion which would allow S-300PT batteries to be retired. Having fewer batteries would certainly mean that fewer targets could be engaged at a given time, but the longer engagement range would alleviate some of this loss by allowing targets to be engaged further down range, with more targets engaged following intercept of the first wave. This would be a sensible redistribution of assets, allowing the capability to be virtually retained by only operating roughly half of the assets. This would result in an appropriate reduction in yearly operating and training costs as well. 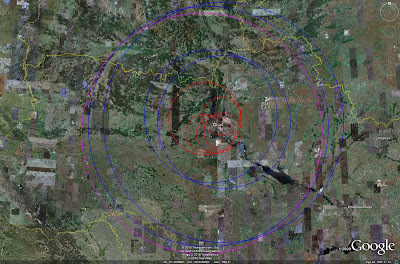 This course of action could necessitate removing and redeploying the solitary S-300PS batteries near Khakovka, Kherson, and Pervomaysk, and the resulting gaps in coverage would need to be assessed to ensure that they represent acceptable degradations of the overall network. Alternatively, S-300PS assets currently identified as being held in-garrison could be field deployed to counter the retirement of S-300PT batteries. The potential gaps in the air defense network which would be caused by a redeployment of S-300PS assets could be filled by the Buk or S-300V1 batteries tasked with an Air Defense Force mission. These mobile units are capable of serving as effective "gap fillers" and complements to the longer-range strategic SAM systems. Buk or S-300V1 batteries could also be deployed to provide close-in defense of key facilities, taking some of the workload from S-300P series batteries. Alternatively, they could be deployed along the nation's periphery underneath known or potential ingress routes in an attempt to ambush inbound aircraft during wartime. 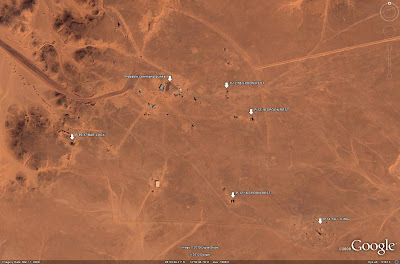 It is interesting to analyze the former SAM locations in a historical sense. The Soviet military had placed two ICBM units in the Ukraine under the command of the 43rd Missile Army. 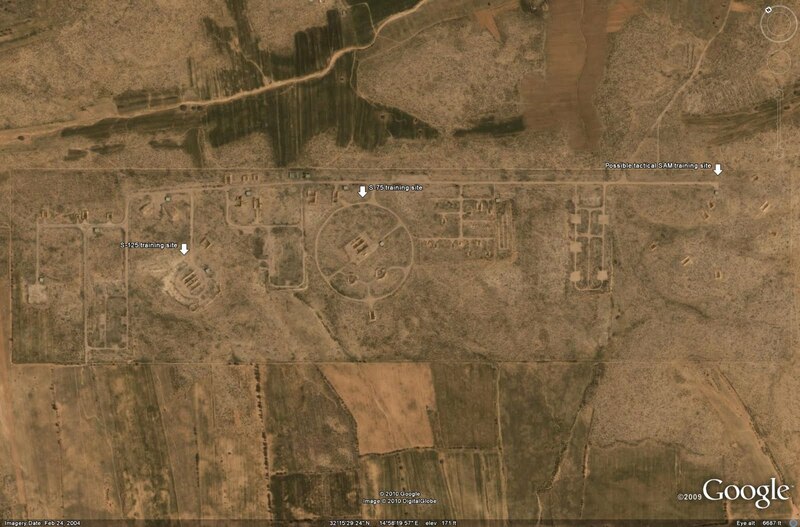 These were the 19th Missile Division near Khmelnitskiy and the 46th Missile Division near Pervomaisk. It is interesting to note that, while numerous active and inactive SAM sites are located near Pervomaisk, no evidence of strategic SAM deployment near Khmelnitskiy has been found. This would seem to indicate that the defense of ICBM batteries was not a significant priority, or that this mission was primarily handled by aerial assets. Despite the modern, robust nature of the Ukrainian air defense network, it will require modernization in the future. The S-200 and S-300PS systems will likely require replacement in the 2015-2020 timeframe. Even without taking service life into account, both systems are likely nearing (S-300PS) or past (S-200) their prime, thanks to constant development of ECM and SEAD/DEAD systems and tactics throughout the world. The simplest option would be to procure S-300PMU-2 Favorit (SA-20B GARGOYLE) or S-400 (SA-21) systems from Russia, as they would be able to operate within the existing EW and battle management networks. This could also be packaged together with Buk-M2E (SA-17 GRIZZLY) systems as Buk-M1 replacements. Current tensions with Russia regarding Ukrainian desires to join NATO and the nation's support of Georgia have been well-publicized, but may not be enough to impede an arms deal of this expense. The Ukraine is a member of the CIS Air Defense Network and has shared information in that capacity with Russia, continuing to do so through 2009, and participates in various multinational exercises related to the network as well. Russia and the Ukraine also do well over $10 billion USD in trade annually, demonstrating that while the governments do have issues they are still able to coexist and cooperate in other areas. After the breakup of the USSR, the Ukraine began to research many indigenous missile systems, including the Grom/Sapsan SRBM and Korshun GLCM. An IR-guided AAM, the Izdelie 611 "Gran" is also under development, and could represent a stepping stone towards a new SAM design. No evidence of any BVR AAM development has surfaced in the Ukraine, but a viable WVR AAM could lead designers down that path in the future. A BVR system, particularly an active or passive radar missile, would certainly be a candidate for surface-launch as a SAM system. Such a weapon could potentially replace the Buk systems, as well as S-300PS systems in a boosted form for extended range. This option remains less attractive than pursuing Russian-made SAM systems, however, as indigenous radars may be required and development could consume a decade or more given that the Ukraine is basically starting from scratch. An alternative but more complicated solution would be to merely develop a SAM to replace the 5V55-series missiles employed by the S-300PS. This would enable the system to retain the guidance systems and components of the S-300PS, while rejuvenating its service life through the addition of a new missile with a new solid rocket motor. The last option would be to purchase a foreign-made, non-Russian SAM system. NATO entry could theoretically open the doors necessary for a Patriot or MEADS purchase. While these systems would certainly be viable, they would potentially require a new EW network for support, further increasing the overall cost of modernization. This EW requirement stems from the issues many nations have had, particularly Greece with the S-300PMU-1 (SA-20A GARGOYLE) and Patriot, at getting Russian-made and Western-made SAM systems to operate cooperatively. In that light, a Russian-made SAM system purchase would be far more logical. 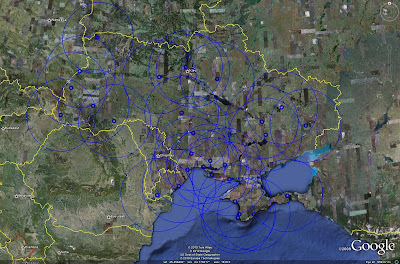 The Ukrainian Air Defense Force remains a very capable, modern SAM network. With a renewed focus on training and professionalism in the Ukrainian armed forces as a whole since 2005, the Air Defense Force stands ready to take on any regional aggressor and defend the citizenry underneath its umbrella. It will be very interesting to watch as the network evolves in the coming decade. This article has been updated, the original version was published in July of 2009. 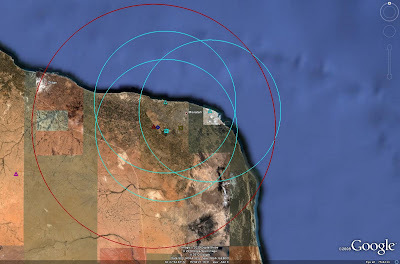 Libyan strategic SAM assets are subordinate to the Air Defense Forces, which in turn are subordinate to the Libyan Air Force. Currently believed to be divided into five separate regional commands, the Air Defense Force operates a variety of Soviet-era equipment. 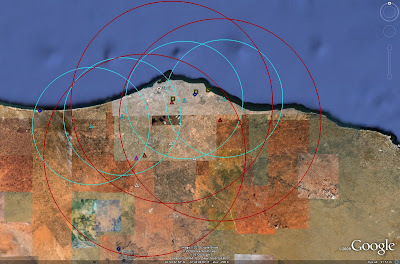 The following strategic SAM systems are currently serving within the Libyan Air Defense Force: S-75 (SA-2 GUIDELINE), S-125 (SA-3 GOA), and S-200 (SA-5 GAMMON). In addition, Libya is reported to have received five Italian LPD-20 air search radars in 1983 and three Soviet 5N69 (BIG BACK) EW radars between 1984 and 1985. 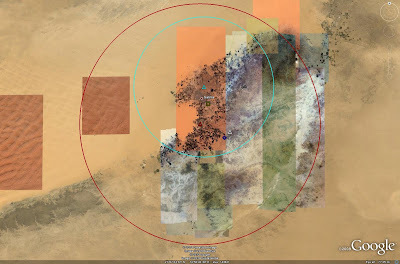 None of these systems have been identified in available imagery, but that does not preclude their existance. The following image depicts a notional Libyan EW site, located near Sabha in the western portion of the nation's interior. 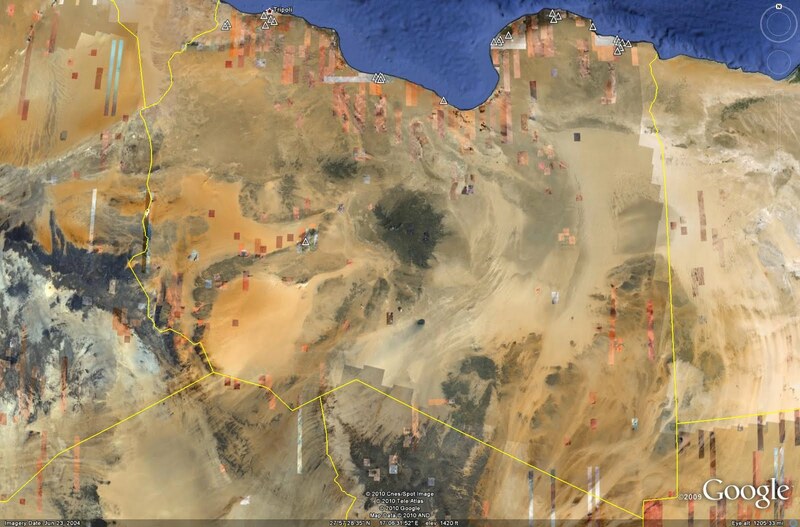 This is representative of roughly one third of Libya's EW sites. Five sites are only fitted with P-12/18 series radars, with five being fitted with multiple radar systems. The P-12/18 sites likely serve to bolster or extend coverage, with the five sites containing multiple EW radars possibly serving as the command centers for the aforementioned regional commands. Some strategic SAM sites contain their own organic EW elements. This allows them to perform independent target acquisition, or to accept long-range track handoff from regional EW centers. Seven SAM sites, four S-75 and three S-200, have identified EW assets. S-75 sites feature P-12/18 radars, with S-200 sites featuring P-14 radars. No S-125 sites, and the remaining S-75 and S-200 sites, contain identified EW assets, but this is likely due to the quality of available imagery rather than a lack of assets. 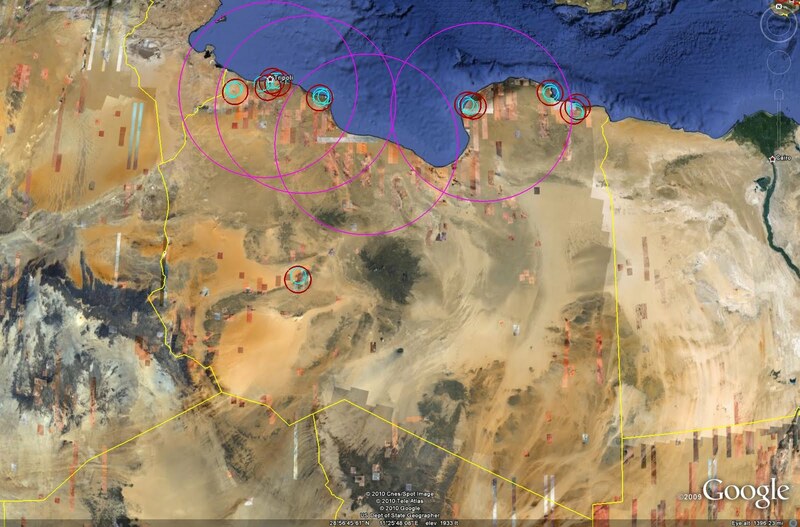 There are currently thirty one active strategic SAM sites located in Libya. 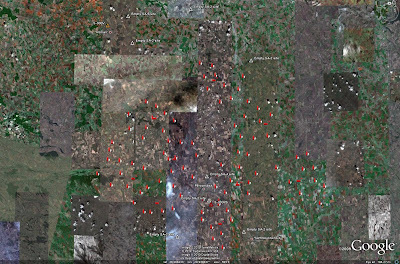 The following image depicts the locations of these sites. S-75 sites are red, S-125 sites are light blue, and S-200 sites are purple. As can be seen, the overwhelming majority of the deployed strategic SAM assets are located along the same coastal regions featuring the bulk of the EW assets. 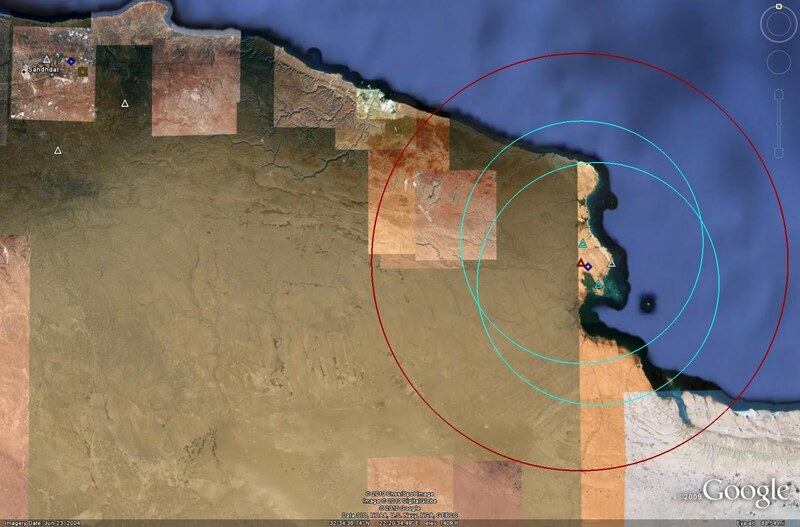 The following image depicts the overall SAM coverage provided by the identified Libyan strategic SAM sites. Using the same color scheme applied previously, SA-2 zones are red, S-125 zones are light blue, and S-200 zones are purple. There are currently eleven active S-75 sites inside of Libya, constituting roughly one third of the strategic SAM force. Russian sources claim that thirty nine S-75M Volkhov batteries were supplied to Libya between 1974 and 1985. Other sources suggest that the initial order of eighteen batteries supplied between 1974 and 1975 consisted of S-75 Dvina systems. S-75 batteries are deployed to protect key population centers and military facilities, predominately along the coastal region. 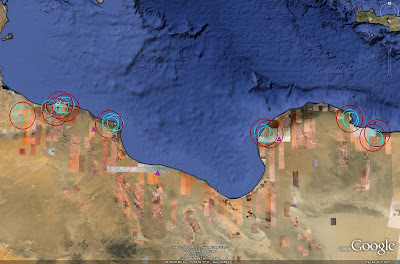 There are currently sixteen active S-125 sites inside of Libya. Eight batteries are situated on former S-75 sites. The S-125 represents half of the deployed strategic SAM assets in the nation. Libya operates the S-125M Neva-M variant, with thirty three batteries being supplied between 1974 and 1976. As with the S-75, S-125 batteries are deployed to protect key population and military facilities, predominately along the coastal region. There are currently four active S-200 sites inside of Libya, each site being equipped with two batteries. The S-200 represents the longest-range strategic SAM system in the Libyan arsenal. The proximity of these four locations to the coastline allows them to range far out into the Mediterranean, theoretically providing a significant standoff engagement capability. Six S-200 batteries were initially supplied to Libya between 1985 and 1986, with a further five being delivered in 1988. There is some confusion as to which variant Libya operates. Russian sources refer to the system delivered as the S-200VE, but the SIPRI arms trade register refers to the system as the Angara, implying that the longer-range S-200DE was delivered. 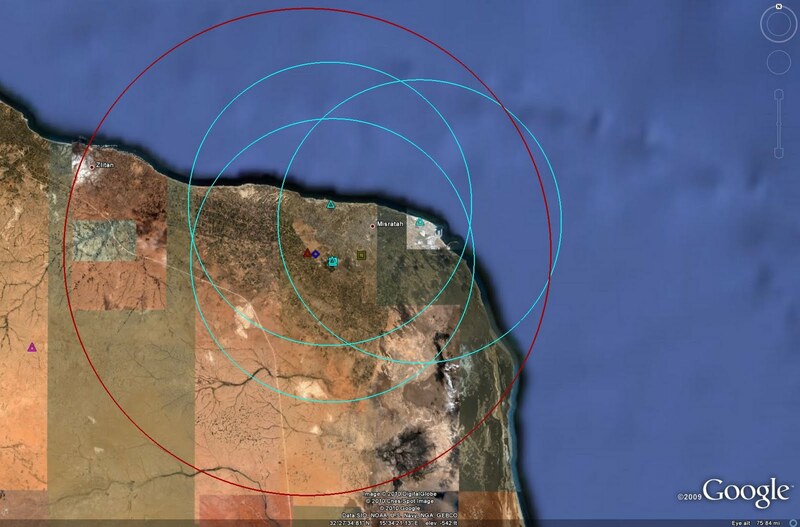 The following image depicts the coverage provided by Libya's active S-200 batteries. 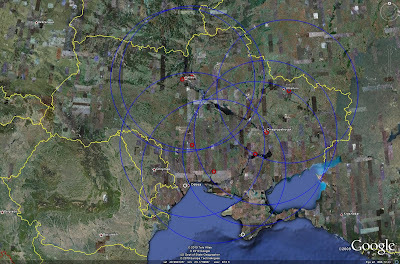 A range of 300 kilometers is used, corresponding to the Angara variant. The Libyan Army operates various tactical SAM ssytems which could be called upon to provide point defense of serve as gap fillers in the overall air defense network. These systems include the 2K12 Kvadrat (SA-6 GAINFUL), 9K33 Osa (SA-8 GECKO), 9K31 Strela-1 (SA-9 GASKIN), 9K35 Strela-10 (SA-13 GOPHER), and Crotale. While the 9K33 is the most numerous system, the 2K12 represents the msot capable tactical SAM system. There are currently thirty identified inactive strategic SAM sites located in Libya. There are fifteen S-75 sites, eleven S-125 sites, and four S-200 sites. These sites are all located within areas featuring active SAM batteries. As such, they may represent facilities available for bolstering the defenses of a given region during hostilities, drawing on equipment held in garrison, or they may represent dispersal locations for the realignment of SAM deployments over time. To support the latter concept, it should be noted that five inactive sites, two S-75, one S-125, and two S-200, have hosted operational batteries at some point in the past. Also, three S-125 and one S-200 site currently operational were noted as being inactive at some point in the past. This suggests that there is a policy of redeployment and reorganization that occurs. Militarily this is a sound strategy, as it complicates the targeting of these facilities by a potential aggressor. While it is true that new site locations can be deduced by imagery or ELNT analysis, it adds to the workload of pre-strike planners. Eleven facilities provide logistical support for the overall strategic SAM network. Ten of these facilities are SAM garrisons housing undeployed equipment and missile reloads, with the remaining facility being a dedicated SAM training complex. Seven of the SAM garrisons are generic facilities supporting multiple systems. Based on the identification of system components in available imagery, two of the remaining SAM garrisons appear to solely support the S-75, with the remaining garrison supporting the S-125. All garrisons are located in the vicinity of prepared launch sites. Libyan strategic SAM assets are arranged to provide a layered air defense zone with overlapping fields of fire. S-75 and S-125 batteries are located in close proximity to provide both redundancy and support, with the S-125 being more capable at lower altitudes than the S-75. The large number of inactive sites suggests that the force has been drawn down over time. This could be due to service life issues, equipment failure, financial reasons, or the expenditure of missile stocks. The first line of defense in Libya's strategic SAM network is the S-200. Positioned along the coastline, the four active S-200 batteries provide a credible deterrent to high-RCS cooperative targets such as ISR platforms. S-200 batteries are located near Tripoli, Misratah, Surt, and Benghazi. Libya's S-75 and S-125 sites are concentrated primarily along the western and eastern coastlines. While the S-200 batteries are situated to provide barrier air defense of the nation's coastline, the S-75 and S-125 sites are positioned to provide point defense of assigned areas. From west to east, these sites are arrayed around Ibn Nafa airbase, Tripoli, Misratah, Benghazi, Bombah, and Adam. While contiguous coverage of the coastal region is not provided by these sites, each location is defended by no fewer than three batteries. Ibn Nafa and Bombah are defended by one S-75 and two S-125 batteries, Misratah is defended by one S-75 and three S-125 batteries, and Benghazi and Adam are defended by two S-75 and two S-125 batteries. 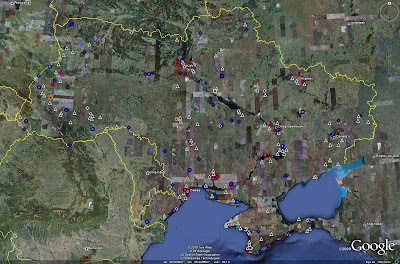 Interestingly, while Surt features an active S-200 battery, all S-75 and S-125 sites in the area are currently inactive. This leaves the coastline along the Gulf of Sidra relatively undefended. The most heavily defended city is the capitol of Tripoli. Tripoli is defended by three S-75 and four S-125 batteries, with an S-200 battery positioned south of the city. Three SAM garrisons and three EW facilities are also present in the area, as are four inactive SAM sites. The following images depict SAM-related facilities and coverage zones near the remaining coastal areas. Sabha is the only inland city within Libya to have any strategic SAM defenses. Much of the Libyan interior is sparsely populated, as are the regions it borders. What then makes Sabha stand out as a location requiring SAM defenses? 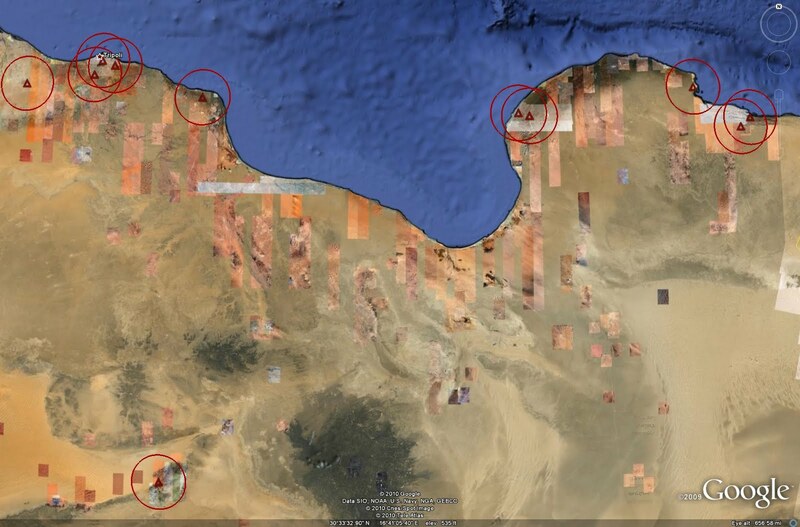 First, Sabha is believed to have been associated with the defunct Libyan nuclear weapons program. Second, Sabha was home to Libyan rocket development in the early 1980s, when the OTRAG rocket was tested from the Seba Oasis launch facility. There remains a significant military presence in the area, which is likely the ultimate reason for the presence of strategic SAM assets and related support facilities. 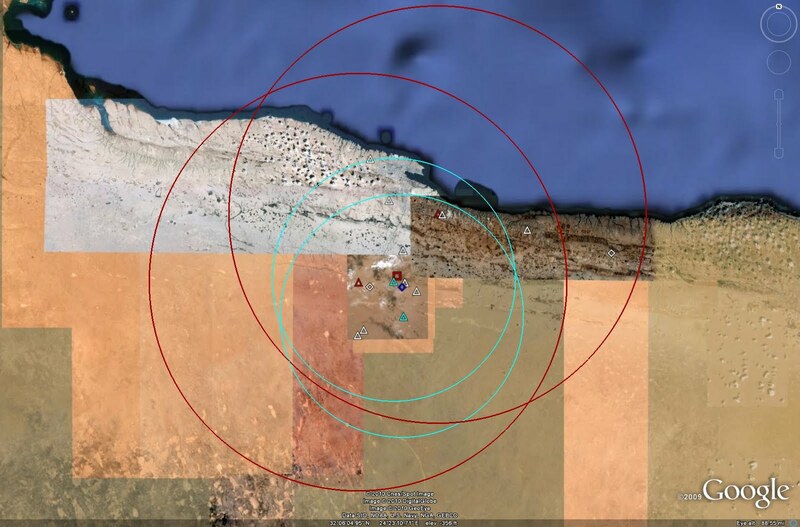 Libya's strategic SAM network is logically arrayed to defend key facilities following a point defense strategy, with long-range S-200 systems providing standoff barrier air defense along the coastal region. However, Libya's strategic SAM network has many flaws. 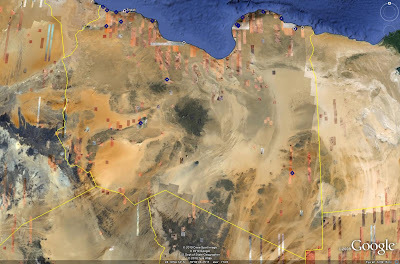 The main drawback of the Libyan strategic SAM network is an overreliance on aging Soviet technology. Russian manufacturers presently produce what are arguably the most advanced and capable land-based strategic SAM systems in the world. Much of their success lies in the fact that they have produced a diverse array of SAM systems with numerous variants. However, this history also presents a problem for nations relying on older technology: the rest of the world has simply passed them by. Advances in electronic warfare and ECM have made many of the older Soviet-era SAM systems obsolete in a modern air combat environment. Libya's S-75, S-125, and S-200 systems are no exception. Furthermore, despite some claims to the contrary, the Libyan strategic SAM force was generally ineffective during hostilities with the United States in the mid 1980s. In one case, Soviet military officials deduced that the S-200 succeeded in downing three US Navy aircraft in March of 1986, based only on the perception of fragments on the radar readouts and the presence of helicopter activity in the area, the latter being attributed to CSAR efforts. The USN has never disclosed any aircraft losses during the incident, which in and of itself does not indicate that no aircraft were lost, but the other two pieces of "evidence" can easily be explained. The apparent appearance of aircraft fragments on the radar operators' screens could have been attributed to chaff dispersal or radar interference, especially if the aircraft descended below the radar's field of view. Also, helicopter activity is not limited to CSAR operations in the USN; helicopters active at the time could have been performing anti-submarine patrols, searching out and identifying surface contacts, or simply flying proiciency sorties. Whatever the case may be, the evidence does not conclusively indicate that any USN aircraft were downed by S-200s, and if the Russians or Libyans have any evidence to the contrary they have certainly never seen fit to bring it into the open. Later in 1986, the Libyan strategic SAM network was abused during Operation ELDORADO CANYON, the US military response to Libyan support of terrorism. Lieutenant General Vladimir Yaroshenko, a former officer in the Soviet PVO SAM Troops, was assigned to analyze the poor performance of the Soviet supplied SAM systems in that operation. LTG Yaroshenko has reported his discovery that poor command and control, poor radar coverage, and a lack of appreciation for American anti-radar weapons and tactics precluded effective target engagement. One interesting fact which he mentions is that the S-75 batteries had a minimum engagement altitude of 100 meters, corresponding to the S-75M Volkhov system as mentioned previously. He also confirms that only one US aircraft, an F-111 shot down by AAA fire, was lost, despite Venikian levels of propaganda claiming otherwise at the time. The second drawback to Libya's strategic SAM network is one of layout. If it is accepted that older Soviet-era systems may still be reliable against regional aggressors lacking modern, sophisticated EW or ECM suites, the system still has a significant number of gaps that could be exploited. The S-200 represents the only significant over water threat, but is constrained by having a minimum engagement altitude of 300 meters. Any terrain-hugging aircraft or cruise missiles would easily be able to exploit this weakness to approach the Libyan coastline. 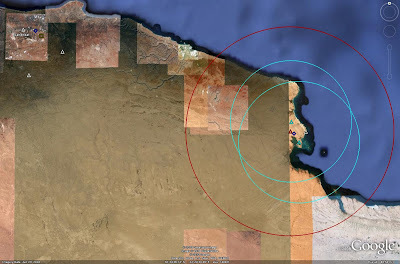 Once the coastline has been reached, the most obvious point of ingress would be the area adjacent to the Gulf of Sidra, which is devoid of deployed strategic SAM assets. Furthermore, as evidenced in the image seen previously, there are gaps between areas covered by S-75 and S-125 batteries which could also be exploited. This does not of course take into account the presence or performance of interceptors, AAA, or tactical SAM units, as these systems are outside the scope of this analysis. At the end of the day, the Libyan strategic SAM network requires a massive infusion of new technology to remain viable in the twenty first century. It was not capable of repelling an attack over twenty years ago, and there is no reason to suspect that it will be capable of such action today. Libya is reportedly negotiating for the purchase of advanced S-300PMU-2 (SA-20B GARGOYLE) SAM systems from Russia, which would go a long way towards modernizing the network and restoring its effectiveness. Colonel al-Gaddafi has made great strides in bringing Libya back into the community of nations, and deserves a large amount of praise for doing so, but that should not lessen the Libyan government's desire or responsibility to provide adequate defense for its citizens. 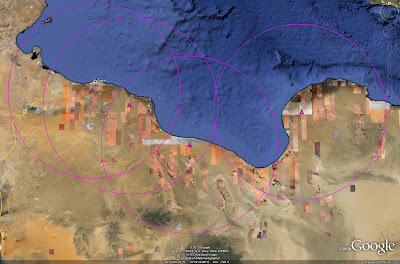 -The aforementioned data is based on analysis of the available open-source satellite imagery of Libya and may therefore not represent the entire air defense network. -What variants of the AIM-4/26 did Greece, Iran, Taiwan, and Turkey receive? Were they ever used in combat? What were the results? -What were the details of the Swedish modification program, which is supposed to have brought the license-built AIM-4C to AIM-4D standard? -Were there any differences between the Swedish license built missiles and those exported to Switzerland? If anyone can point me in the right direction, it'd be appreciated. I'm particularly interested to hear what foreign pilots, particularly those from the Greek, Japanese, Swedish, Swiss, and Turkish AFs, thought of the missile. If you know of anybody that can help, have them drop me a line! Same goes if you know of anybody who may have worked on the missile at some point, particularly the GAR-9/AIM-47. I think I'll start posting the upcoming schedule at the beginning of the month. That'll give you guys an idea of what's coming. I've started formulating a list of topics for the next few months, this way I can work on them bit by bit and have everything done on time, keeping to my new schedule. Feel free to comment and let me know what other nations you'd like to see SAM Network pieces published on, what older articles you'd like to see updated, or if you have any fun ideas for an analysis piece. I've had to order a new keyboard for my laptop. Some of the keys have quit working; this isn't a suprise, as there was an incident a while ago involving my dork of a cat, my laptop, and a glass of Spezi. Most of it works fine, but the numbers 5 and 6 and the - symbol don't, as well as a few others. This makes it relatively impossible to type SA-5! Plus, some of the keys, the d and f most obviously, tend to stick and insert random letters. Fortunately, I already compiled the SAM Site Overview update for this week (to be posted tomorrow after I save and upload the new files), and the new hardware should be here before the week is over. But, as I will keep posting until the new keyboard arrives (the Microsoft On-Screen Keyboard thing is an irritating yet sufficient temporary fix), I'd ask all of you to let me know if you find any obvious typos or other weirdness that slips through the cracks. Keyboard stupidity will not deter me from my new schedule!